In a previous post I gave an example of Shi'a militia fighter recruitment from the Iranian proxy Harakat al-Nujaba via offering phone numbers in social media ads. This does not necessarily mean the militias are not uninterested in those with specialties beyond fighting. 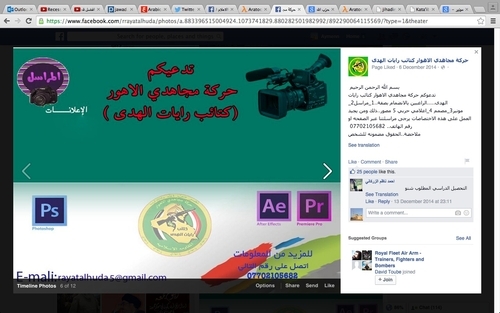 In December 2014, th militia Kata'ib Rayat al-Huda- also aligned ideologically with Iran like Harakat al-Nujaba- put on its Facebook page an advertisement with a phone number to call for recruiting those interested in doing media work for the group, including photography, design and war media activism.